One of the best things about decorating for fall and the ensuing holidays is that almost any material or piece you need can be found in your backyard or around your house. 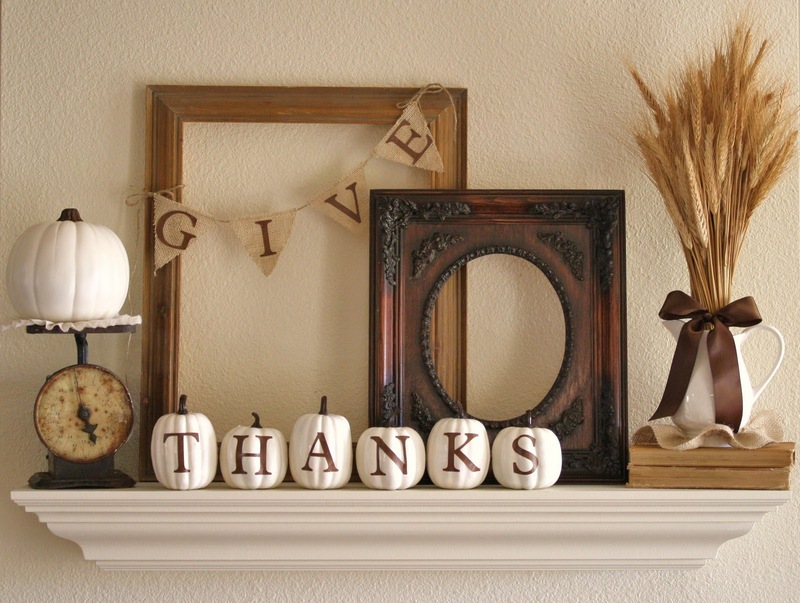 It really is unnecessary to spend money on Thanks giving décor as the best ideas center around natural materials. DIY projects can be so much better too because you can include your family to help create each piece. Some of the best centerpieces can be made just by traipsing through your backyard. Gather a few branches full of colorful fall leaves and then place in a sturdy vase (the best kind of vases for a fall theme are ceramic). If you have access to holly, crab apple, or bittersweet berry branches, grab some of those instead! The great thing with these arrangements is that as soon as your pieces start to wither, you just need to run outside to grab fresh ones. If the table feels cluttered with the food and decorations, switch your centerpiece over to the buffet table or a side table. There are several different kinds of garlands you can create for your door, wall, or mantle. From glittery falling leaves to bunches, to “Give Thanks” pieces. You can use ribbon found in your craft boxes and then just collect large fall leaves from your yard (or you can get some artificial ones for cheap at a Dollar Tree or craft store). To create a “bunch” instead of using only a few leaves, collect a lot of leaves and then string through the center of each. These garlands are perfect for a mantle piece or top of a door especially for your etched glass pantry doors. The great thing about these candle pieces are that you don’t need anything that you can’t find in your home. If you don’t have simple candle holders, you can easily use mason jars or even glasses. Pour a small amount of un-popped popcorn kernels at the bottom of the jars or glasses. Then pour more kernels around the candles, filling about halfway up the height of the candles. If you don’t have popcorn kernels on hand, you can easily replace them with coffee beans for a darker look (or try dried peas or beans). A great idea for easy and cheap placemats is to take some brown butcher paper and cut them into a rectangle large enough for each place setting. On the right-hand side of each mat, write “I am thankful for:” and then draw a few lines beneath. This will give everyone a chance to write down a few things they are thankful for as they eat. If you want to keep the focus on your beautiful table, you can create something a little smaller – a thankful holder for silverware. With this idea, you can either use your computer or hand draw/write “thankful for” on a piece of paper and then a few blank lines following. Use this tutorial to see how to fold the paper and where to place the writing. Often times kids get a little restless when the adults are still eating and chatting at the table. A great way to accommodate their little bodies is to make a table cloth they can play with. Cover the table with craft paper or light brown butcher paper. Place a small pot of crayons on the table for the kids to use to draw to keep them content. To give the table a little more fun, draw makeshift placemats around the plates. To give centerpieces a new spin, create something both beautiful and functional. Place a large serving platter on the table and fill with fruits and nuts in colorful or deeper hues. Along the lines of the edible centerpieces, invest in edible place settings. It’s popular to use pinecones with name tags for place settings, but this year go for something a little more unique and colorful. Place a beautiful pear, persimmon, or apple on each plate. Want to give something a little sweeter? Use a yummy caramel apple. A beautiful DIY decoration you can easily make is this leaf and branch mobile. You can check out this tutorial of making watercolor leaves, or collect a handful of fall leaves from your backyard. Grab a branch from outside too and use thread that is similar to the paint color of your wall, tie the string to the end of the stem of each leaf and then tie to the branch. With chalkboard signs, easels, and walls becoming more and more popular in the home this DIY piece is easy, and well, priceless. Take your chalkboard or wall and clear it off. Using some beautiful stenciling write “Give Thanks with a Grateful Heart” or another thankful phrase. Attach a few small fall leaves to the board as a border and for a pop of color. To get everyone more involved in the holiday, you can create this simple yet sweet thankful tree. Gather small branches and twigs and place in a mason jar. Cut out a bunch of small circles from fun scrapbook paper (remember all those pieces of paper that you don’t want to throw away but don’t know what to do with? They’re perfect for this!) and then punch a small hole at the top of each. Place the circles in a small dish next to the “tree” with a pen and then place everything in an area that is often passed. When guests or family members walk past, they can write down something they are thankful for on a little circle and then place on a branch.